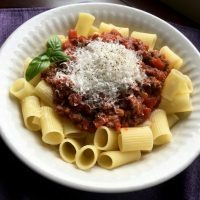 This hearty, chunky meat sauce takes a little while to come together, but it is so worth the extra effort. This recipe makes a large amount of sauce, so be sure to use a 6-quart or larger Dutch oven or pot when making it. This sauce can be enjoyed immediately after cooking, but it tastes even better a day or two later when the flavors have had a chance to mingle. This recipe also freezes up nicely for later use. Save yourself some time by crumbling up the beef and sausage with your fingers prior to browning. This will give you more consistently sized chunks of meat and is much easier than trying to break up the meat while it is browning. In a large (6 Qt) Dutch oven, heat olive oil over medium heat. Add onion, garlic and mushrooms to pan and cook until onions become soft and mushrooms begin to release liquids, about 4 or 5 minutes. Add celery, carrots and ½ cup wine and continue cooking for 3-4 minutes. Return to burner and add tomato puree, petite-cut tomatoes, tomato paste, and remaining red wine to Dutch oven, along with oregano, thyme, rosemary, and sugar. Stir to combine. Drop in bay leaves and Parmesan rind and give a quick stir. Cover and simmer on low heat for 3-4 hours, stirring occasionally. If sauce is too thick, add a little water to achieve the desired consistency. If it is too thin, continue cooking until it reaches the thickness you prefer. Serve immediately with your favorite cooked pasta and some cheesy garlic bread. Refrigerate or freeze unused portion within 2 hours.